In the US, Cesarean Sections (C-Sections) are increasingly popular. 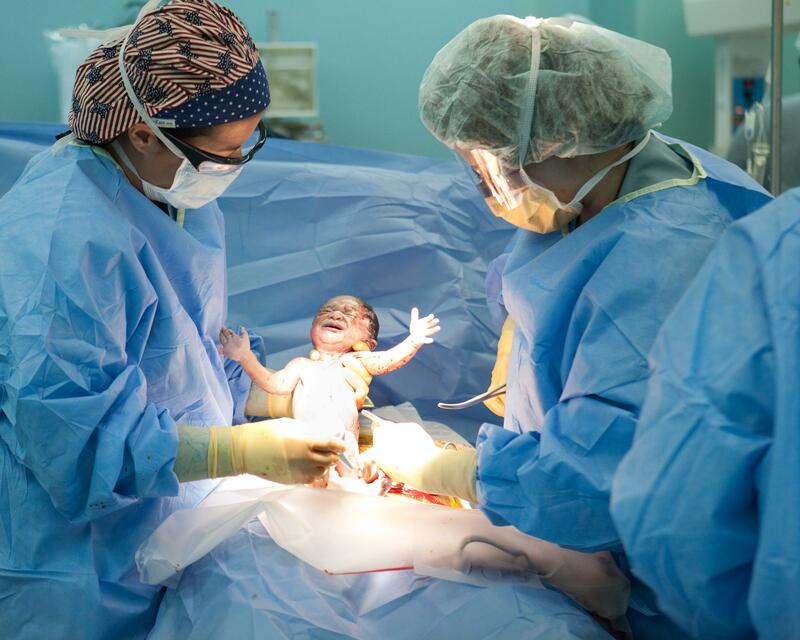 Maybe you’ve had one, maybe you’d do anything to avoid having one, either way, it’s smart to include a c-section portion in creating your birth plan. If you’re planning on having a natural delivery, like I am, there can be a lot of fear and anxiety with the thought of needing a c-section. There are risks involved obviously, with having your abdomen cut open after all. The beauty of c-sections and modern medicine is that they can truly save mom and baby’s life when needed. There are life or death situations in childbirth where both mom and baby would have died centuries ago without the option of c-sections. So, as “un-ideal” as a c-section may be for multiple reasons, it is still a realistic possibility. Instead of panicking when your doctor tells you that your dreams of having a natural birth aren’t going to be a reality because medical intervention is necessary, it would be much better to have a “Plan B” written out beforehand. Thankfully, there are options that you should be aware of. When I was creating my birth plan, I came across a wonderful resource online- http://gratefulforgrace.com/. Author, Melinda Brouse, created an E-book titled, “Make the Most of Your C-Section: Prepare for a More Natural & Personalized Birth”. I was SO excited when I found this resource, because I never thought the words “Natural” “Personalized” and “C-Section” could ever go together. Her experiences and resources prove differently. It’s a wonderful resource that I recommend everyone looking into to know what your options are, even if you’re planning a natural birth. To learn more about this resource, visit Melinda’s site here- http://gratefulforgrace.com/2012/06/make-the-most-of-your-c-section/. Only spinal medication will be given to numb mother for surgery. Baby is pulled out of the uterus slowly to mimic “squeezing” of birth canal. Cord allowed to stop pulsing before clamping or cutting, if possible and dad cut’s cord. No erythromycin, silver nitrate, vaccinations. Vit K injection only if deemed immediately necessary, otherwise oral Vit K will be given. Well checks are done on mom’s chest. Baby stays in mom or dad’s arms the entire time. It’s important to remember that a birth plan is just that…a plan. Plan’s don’t always go perfectly, and sometimes an emergency arises, where you will need to trust the doctors and nurses to do their job in order to do what’s best for you and baby. If you go in for an uncomplicated c-section, however, many if not most of these requests should be met with no problem. This is referred to as a family-centered c-section. Just remember to be nice with your medical staff and not to come across as demanding. This will go a long way.